Deaths by suicide are high: every 40 seconds, someone in the world chooses to end their life. Despite acknowledgement that suicide notes are social texts, there has been no book which analyzes suicide notes as discursive texts and no attempt at a qualitative discourse analysis of them. Discourses of Men's Suicide Notes redresses this gap in the literature. Focussing on men and masculinity and anchored in qualitative discourse analysis, Dariusz Galasinski responds to the need for a more thorough understanding of suicidal behaviour. Culturally, men have been posited to be 'masters of the universe' and yet some choose to end their lives. 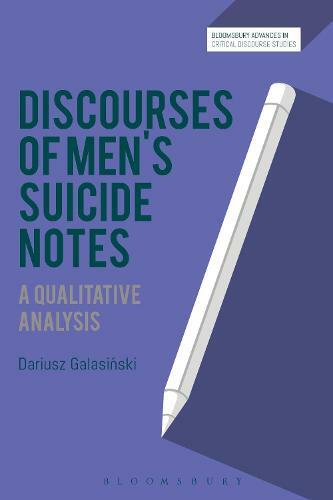 This book takes a qualitative approach to data gathered from the Polish Corpus of Suicide Notes, a unique repository of over 600 suicide notes, to explore discourse from and about men at the most traumatic juncture of their lives. Discussing how men construct suicide notes and the ways in which they position their relationships and identities within them, Discourses of Men's Suicide Notes seeks to understand what these notes mean and what significance and power they are invested with.